■ more specific language for mechanical, electrical and civil/structural engineering. 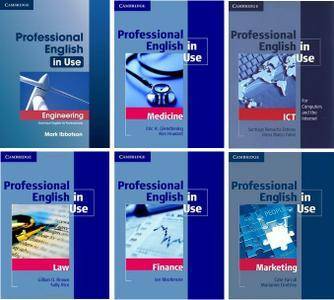 Professional English in Use Medicine contains 60 units covering a wide variety of medical vocabulary. Topics include diseases and symptoms, investigations, treatment, examining and prevention. The book also introduces general medical vocabulary related to parts and functions of the body, medical and para-medical personnel, education and training, research, and presentations. Primarily designed as a self-study reference and practice book, it can also be used for classroom work and one-to-one lessons. Professional English in Use Medicine has been carefully researched using the Institute for Applied Language Studies medical corpus, as well as authentic texts, documents and cases. 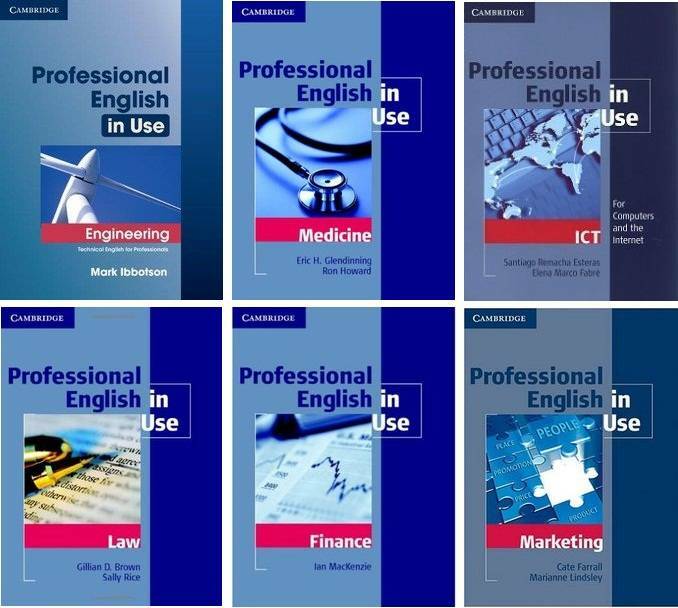 Professional English in Use Medicine is a must for teachers of medical English and for medical practitioners who need to use English at work, either in their own country or abroad. Professional English in Use Finance is suitable for intermediate students and above. It includes 50 units covering all aspects of financial vocabulary from Accounting to Borrowing and Lending, Central Banking to Venture Capital and many more areas including financial idioms and metaphors. Primarily designed as a self-study reference and practice book, it can also be used for classroom work and one-to-one lessons. This book is a must for both trainers and learners of ESP and Business English who need to use English in a financial environment. "Professional English in Use ICT" is designed for intermediate to advanced level learners of English who need to use the English of computing and the Internet for work, home or study. The book covers a wide range of up-to-date topics on Information Communications Technology including computer systems, word processing, spreadsheets and databases, multimedia applications, email, web design and Internet security. There are also units on word building and typical language functions used in the world of ICT. The units present and explain new words in context and show learners how to use them. Primarily designed as a self-study reference and practice book, it can also be used to supplement classroom work. # 40 easy-to-use units: vocabulary items are presented and explained on left-hand pages with a range of practice exercises on right-hand pages. # Presents and explains all new vocabulary in context. # "Over to you" sections give learners the opportunity to put the language into practice. # Informed by the Cambridge International Corpus, ensuring the language taught is frequent and up-to-date. # Includes a comprehensive, learner-friendly answer key. Easy to use and written in a clear style, this book will be invaluable for anyone needing to improve their ICT vocabulary. Professional English in Use Marketing contains 50 units covering a wide variety of marketing vocabulary. Topics include marketing basics, the full 'marketing mix', research, PR, and marketing communications. Primarily designed as a self-study reference and practice book, it can also be used for classroom work and one-to-one lessons, and is suitable for intermediate and upper intermediate students. # Professional English in Use Marketing draws on authentic texts and real companies to present the most up-to-date and comprehensive language and terminology. It is a must for students of marketing or business, and for marketing professionals who need to use English at work. # Presents and explains vocabulary items in context on the left-hand pages with a range of practice activities on the right-hand pages. # Features 'Over to you' activities which enable learners to apply the language they have learnt to their own studies and working lives. Includes a comprehensive, learner-friendly answer key and index. Professional English in Use Law is suitable for upper-intermediate to advanced students and contains 45 units covering a wide variety of legal vocabulary. Topics include corporate and commercial law, liability, contract law and intellectual property. The book also introduces general legal vocabulary related to legal systems, the legal professions and the skills lawyers need in their daily working lives. Primarily designed as a self-study reference and practice book, it can also be used for classroom work and one-to-one lessons. Visit fresh books in my Blog!